Who needs a home button? 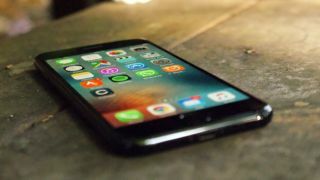 Apple could be preparing to phase out the iPhone’s home button if its recent patent for a fingerprint reading touchscreen is any indication of the company’s future plans. First spotted by AppleInsider, the patent describes an “interactive display panel with IR diodes” that would use a combination of infrared emitting LED and infrared sensing technology. This would allow Apple to place a fingerprint reader directly into the phone’s screen rather than the currently used home button. The patent was originally filed in 2014 by micro-LED display company LuxVue, but it was reassigned to Apple after it acquired the company. This isn’t, however, the first time we’ve seen Apple look into fingerprint reading touchscreen technology. Only last year Apple filed another patent that suggested the company was looking at moving Touch ID away from the home button and into the phone screen. This more recently revealed design is slightly different from as it doesn’t require the layering of two separate transducers, instead relying on micro-LED technology which should allow for more accurate sensing and reading of fingerprints. By integrating the home button and its fingerprint scanner into the phone’s screen, Apple would open up a good deal of extra space at the bottom of the phone, allowing for an extended edge-to-edge display and even more streamlined aesthetic. Rumors that Apple could be considering dropping the home button to move onto more advanced technology than Touch ID have been circulating for a while now and this micro-LED technology would certainly allow for that. Whether or not Apple will actually use it in its next phone, or at all, is unclear. It would, however, enable the big hardware change people are anticipating for the iPhone 8 as the company celebrates ten years since the original iPhone’s release.